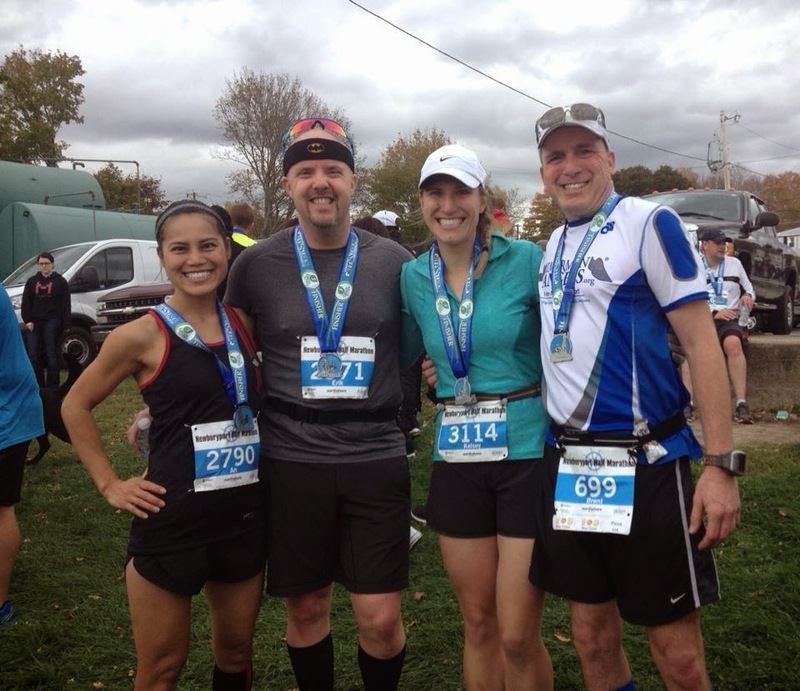 I recently ran my first half marathon ever at the Newburyport Half Marathon in Newburyport, MA. A few of my buddies from the triathlon club were going down and they really laid on the peer pressure to join them. I'm so glad that I decided to go, because we had a blast! We had a nice drive down to Massachusetts and the best hosts in Elaine and Dave (and Devon and Hot Pocket). On Saturday, our group enjoyed a big pancake breakfast, a shakeout run around the neighborhood, and a trip into downtown Boston (with a stop at a bike shop of course), including Mike's Pastry's famous cannoli (pre-race fuel...yum!). Saturday evening a few other runners came over for a pre-race dinner of delicious fresh pasta, salads, and yummy dessert. Of course, I also painted my nails (Essie Boom Boom Room and Turquoise and Caicos), to the amusement of my fellow runners, and made Brent and Erik watch "Dreams of Glory" with me (aka my Pre-Race Rituals). On race day, I woke up at 6:40 to get breakfast and get organized for departure at 7:30. I made myself some oatmeal with natural PB and banana, with a nice large coffee on the side. The shakeout run from Saturday determined my wardrobe - Lululemon Speed Shorts and 105 Tank, long sleeve half-zip, Smart Wool merino socks, and my Mizuno Wave Sayonaras. Completing the kit - my Garmin, my Nike running hat, CamelBak Podium water bottle, and a race belt for my bib, just in case I needed to take off the long sleeves. We drove about an hour to the race site and I decided that a little nap in the car was necessary. When we got there, we went to pick up our race kits then returned to the car to drop our extra clothing off, before heading back over to the port-a-potties (plenty of time, even with long lines) and the start line. I did a few drills to warm-up, then positioned myself between the 7:00 and 8:00/mile signs in the starting area. Going into the race, I had a few goals kicking around in my head. One was that I would be happy with anything under 1:45, especially since I had never done a half marathon and wasn't sure that my training had been sufficient. Stepping it up a notch, I wanted to finish closer to 1:42, maybe even as fast as 1:40. Going beyond that, my goal was to hold 7:30 per mile pace, which was about the pace that I ran my 10k at the Montreal Esprit Olympic Triathlon. I figured that if I could go that pace after swimming 1500m and biking 40k, then maybe I could do it in a half marathon as well. Obviously, my number one goal was to have FUN!! In the end, enjoying myself and the experience was of the utmost importance. Staying positive, smiling, and reminding myself how lucky I was to be healthy enough to participate in the event helped me to ensure that I reached my goal. Mile 1: Okay, Kels. Let's see how this goes. I told myself to hold back a little and not get swept up in the adrenaline of the start. But I felt great, so I still allowed myself to go a little faster than my planned 7:30 pace. Mile 2: Still feeling good, maybe I will try to stay closer to 7:20 pace then. Mile 3: I spot two women running together. They have amazing running form and make this 7:20ish pace look super easy, so I decide to try to keep them in my sights. Nice to have some "pace bunnies." Mile 4: A nice big downhill! The "pace bunnies" flew by me and shouted, "where is everyone? we are going downhill." I picked up my knees and let myself fly down behind them, deciding that I was going to take advantage of the downhills as much as I could. Mile 5: We approach a section with tons of spectators, awesome! Then we turn down along a beautiful lake. For the first time, there are cars on the road with us, but not for very long. We also have the wind in our face and a slight uphill. I'm still feeling good, but mentally I slip for a second when I realize that we aren't even halfway. Mile 6: Just keep running. I remind myself that this is going well and to relax. Mile 7: Ah saw a guy carrying his shoes and walking, so I asked if he was okay. I felt bad that his race was potentially over, but glad that I was still trucking along at a good pace. This was a really picturesque part of the course along the lake. Happy to be over halfway finished. Mile 8: There was an aid station with gels and lots of other goodies. I had my gel packed away in my CamelBak holder, so I ran by the station, not having decided whether or not I was actually going to use my gel. I later decided that my energy level and mental power were fine, so I skipped the gel. We came back to the area with all the spectators and the crowd was really supportive! Mile 9: Whew, giant overpass to run over. Cars driving below were honking their horns, thanks guys! Following the overpass was a nice stretch of flat road... finally! As I ran along, with lovely fields to either side, I reminded myself again how awesome it was to be there, just running along and healthy enough to participate. Mile 10: Just before the 10 mile mark hit, I stopped for the first time during the race to actually drink a sip of the Gatorade that I grabbed from the aid station (the first one I stopped at all race since I carried my water bottle with me). 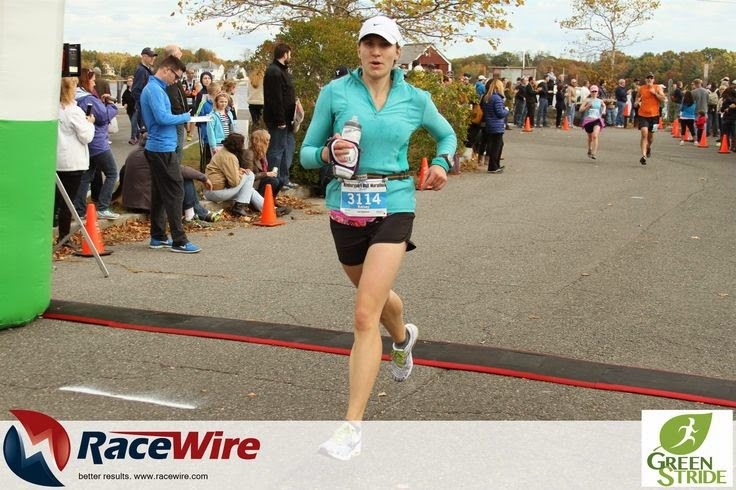 At that point my water bottle was nearly empty and I thought a bit of sugar would help me get to the finish. As we started running again, I guess I cut a guy off by accident and he said thank you for blocking the wind. I laughed. Then we headed to an out and back on a road in an industrial park. A lady told me that it was instead of a hill, so I thanked my stars, even though we were again running directly into the wind. Mile 11: Wow, this is officially further than I have ever run!! I can't believe I'm still going. Mile 12 and 13: This is getting hard. My legs are feeling heavier, but then I spot Jennifer, I know you!! Waving arms like a crazy lady. And then we get a nice little downhill. As we ran toward it, I was encouraging a guy next to me. We only have less than a half mile to go, we can do anything for a few more minutes. He told me he had been trying to break 1:40 forever and I told him he was going to do it for sure! I remind myself that I have to leave it all out there since this is potentially my last race until the spring. Finish: The last part of the race was awesome. The path was fairly narrow and jam packed with spectators along both sides. A sprint to the finish. I see my Garmin flashing around a 6 minute mile for the sprint. I see the clock ticking toward 1:37 and I do my best to beat it (forgetting to smile for the cameraman as evidenced in the photo above!). What an awesome experience! It was a beautiful day, with lots of community support, on a lovely course. I was obviously very happy with my result and somewhat surprised that I was able to push myself that hard! Oh yea, as excited as I was going into the race for post-race festivities, including beer and pizza... my tummy was not that into it. But, the Green Stride team puts on a great post-race party for sure! Congratulations on your stellar result and perspective!! 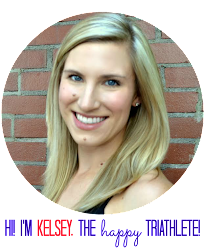 You're a great ROAD TRIPPER Kelsey, I'd be happy to travel with you anytime! Looking forward to reading about your future races and goals and hopefully sharing some course with you (albeit at a much more patient pace) in the future. Thank you Brent! Hopefully there will be another race road trip in the future! Girl, I would love to run with you. Not only do you have a positive mentality, but also you are FAST! You would definitely challenge me to keep up. Congratulations on finishing your FIRST half marathon and in an incredibly fast time!! Wow wow wow. You must be feeling so proud, as you have put in so much hard work this season. 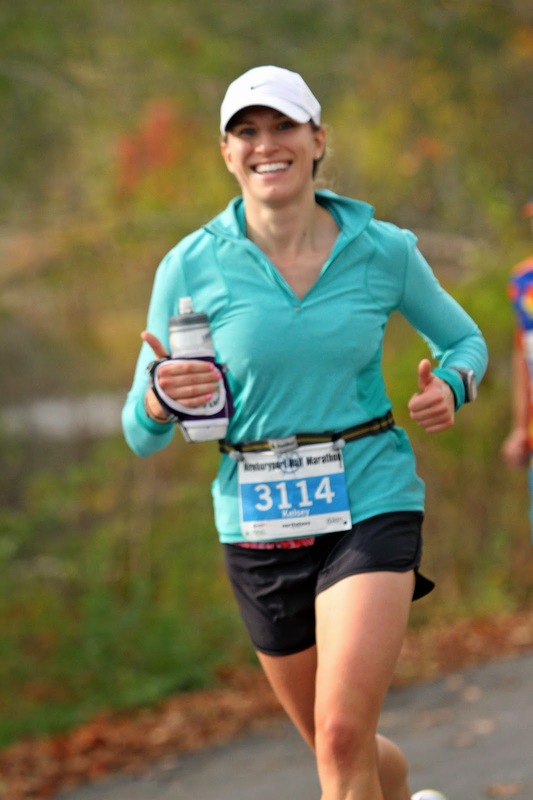 I loved reading your mile-by-mile recap and what was going through your head. Now that you have your first race under your belt, I can’t wait to see what you can do in the future!! Great race! I live maybe 20 minutes North of NBPT. I ran that race 2 years ago, so I was remembering the course as you were writing about it! (I ran it much slower...) Great job!